They say size doesn't matter, but when it comes to 3D printing, it really does. Low cost 3D printers have been buzzing around the internet and promising to be the next big technological breakthrough that will change our society. But most can only print small objects... nothing large enough to actually prompt that "big" revolution. Someday, we'll probably have 3D printers large enough to print entire homes, and cars, and airplanes - but until then, you may want to give this Big Rep ONE a try. While popular 3D printers like the MakerBot Replicator 2 can only print 11.2 x 6.0 x 6.1 inches, this BigRep completely obliterates that, allowing for objects up to 45 x 39 x 47 inches - that's 46 cubic feet! 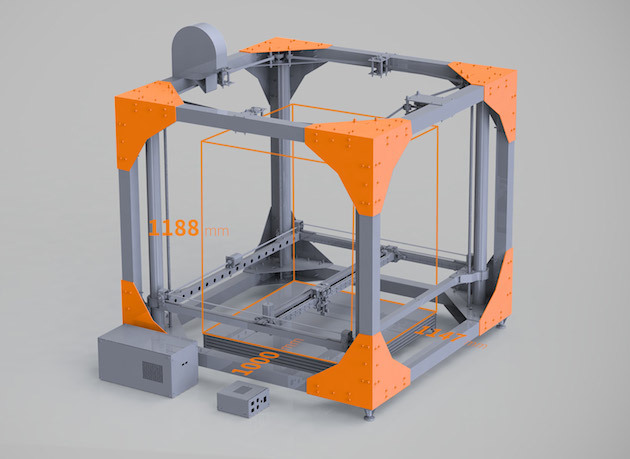 Costing $39,000 this BigRep won't be competing with the destkop low-cost 3D printers on the market, but if you ever come across a project where size does matter, at least you'll know there's an option out there. If you had one such printer, what would you print?